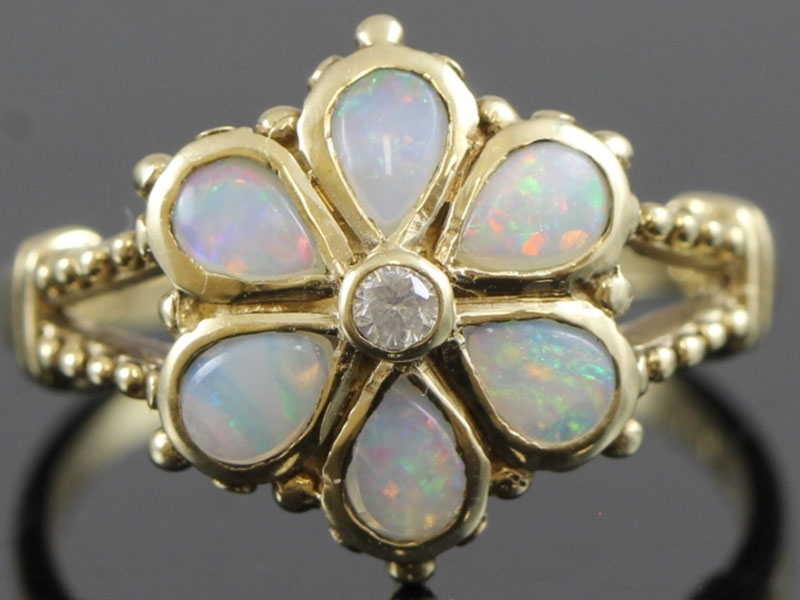 Sweetness becomes personified in this ring adorned with seven beautiful Opals of gorgeous fire. This stylish ring features a beautiful Opal collate set between two sparkling Brilliant Cut Diamonds. 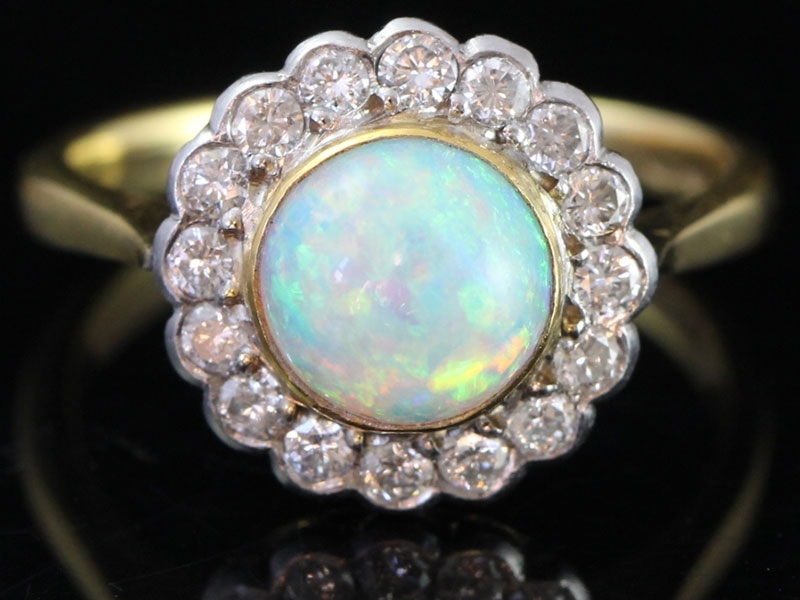 This stunning Opal is a kaleidoscope of vibrant colours which contiunually changes colours with the light. 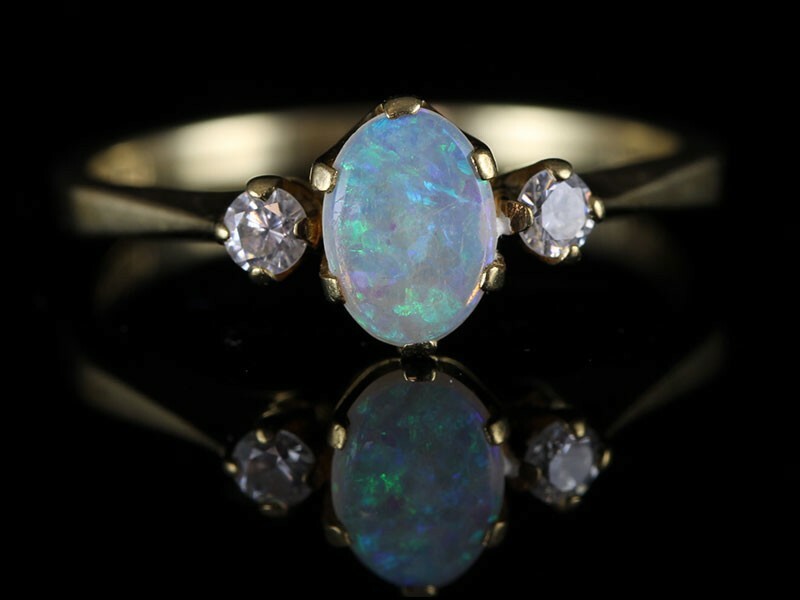 A very pretty Opal and Diamond ring in an unique setting. 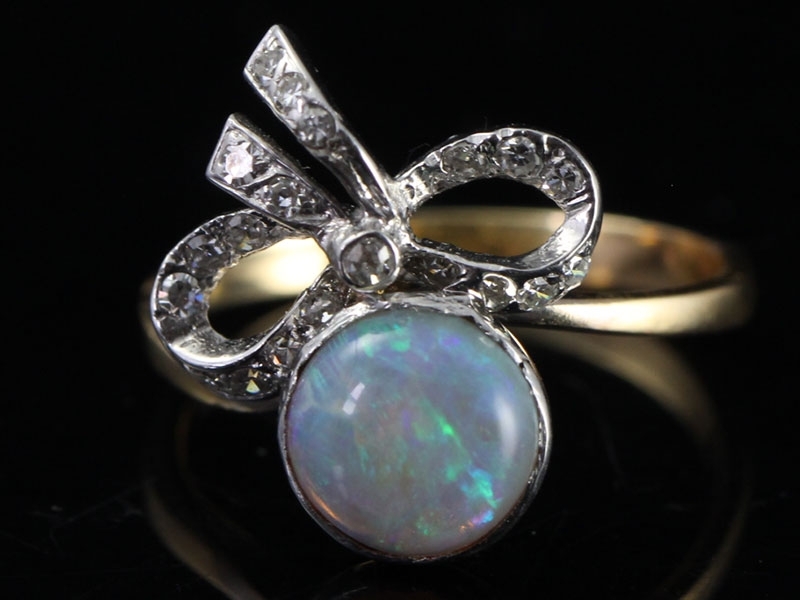 There are eight cabochon Opals and one single Brilliant Cut Diamond. 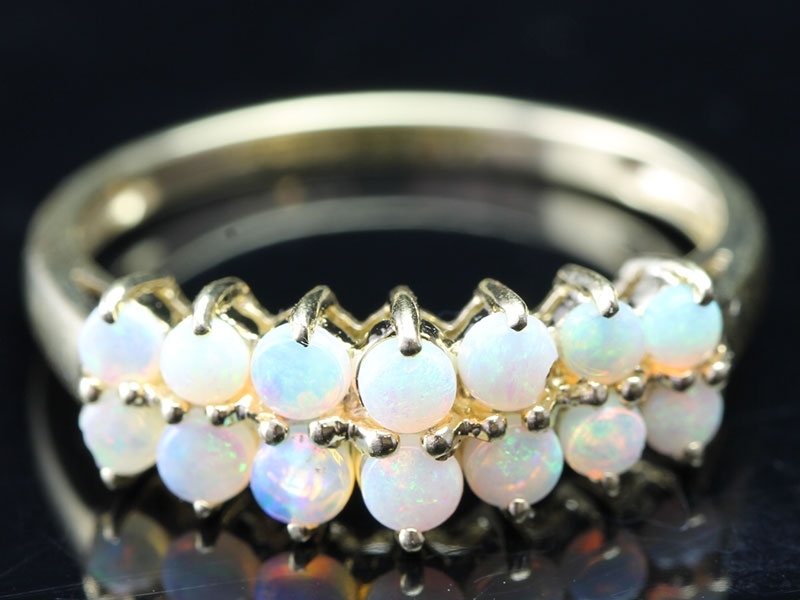 This darling of a ring is beautifully claw set with a centre Opal of 4 mm wide and 5 mm long. 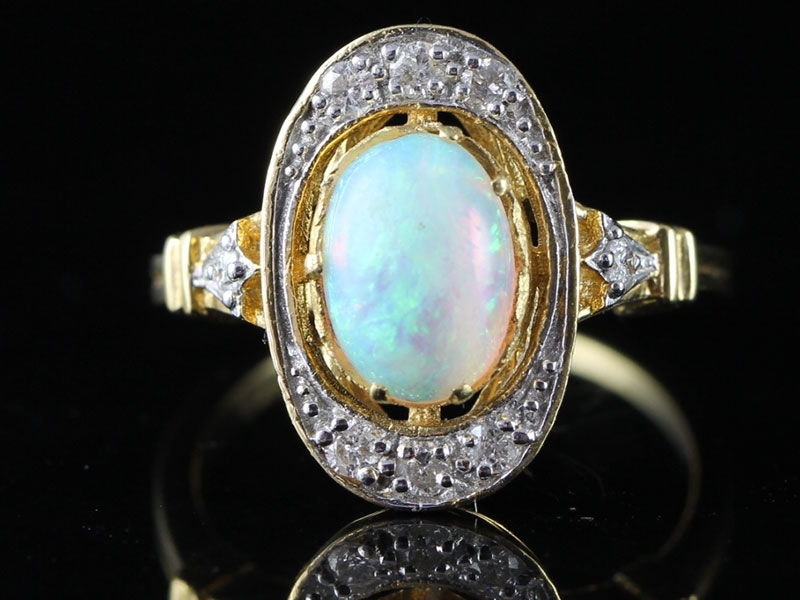 The fiery Opal and an array of 20 surrounding Opals set in 9 carat Gold in a dome setting. This magnificent piece is set with 15 fiery Opals in a delightful 9 carat Gold chunky cluster setting. The simple lined detail on the shoulders adds to the beauty of this ring. 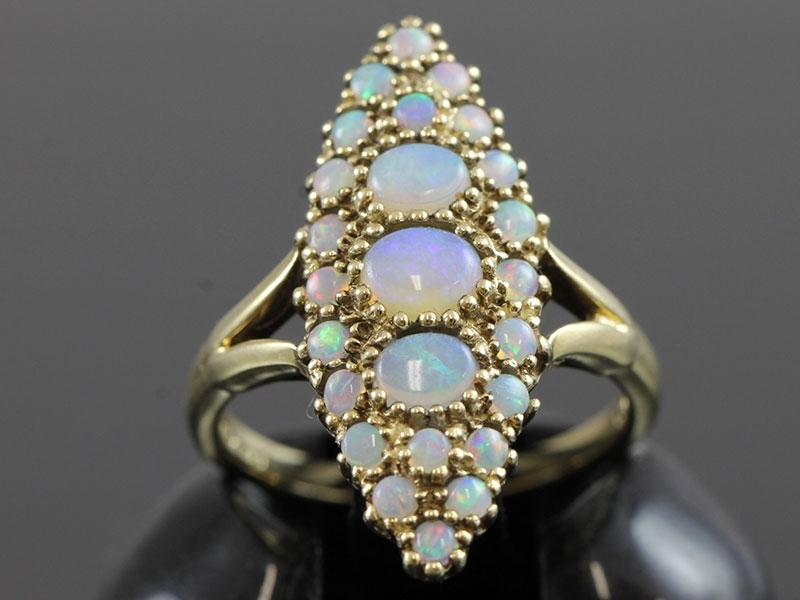 An impressive Georgian inspired style marquise Opal ring set in 9 carat Gold. 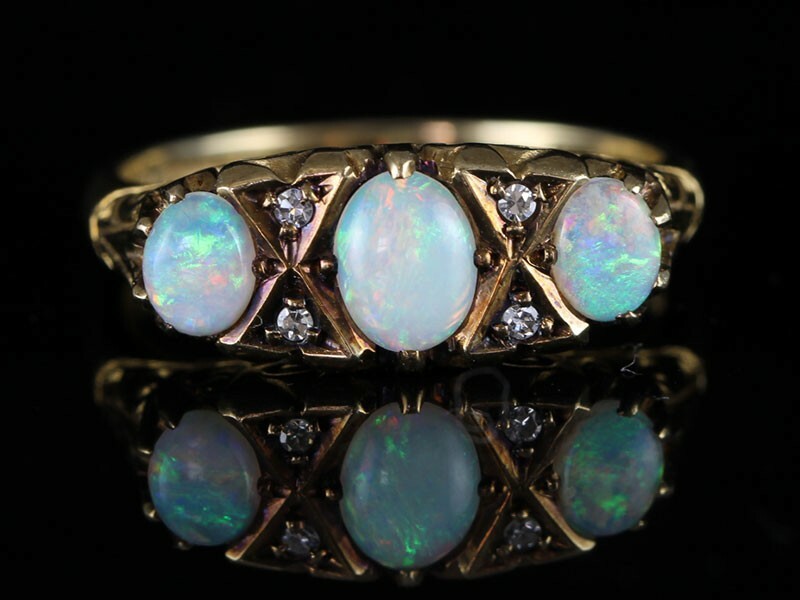 The centre houses three oval fiery Opals and are surrounded by 22 circular Opals and held in the setting with an open back. 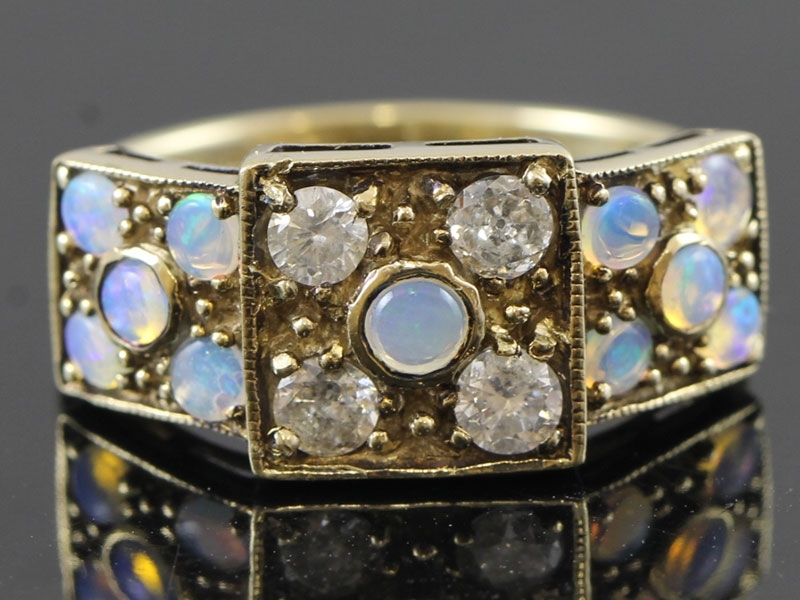 A sleek and stylish revival inspired turn-of-the-century Opal and Blue Zircon ring. 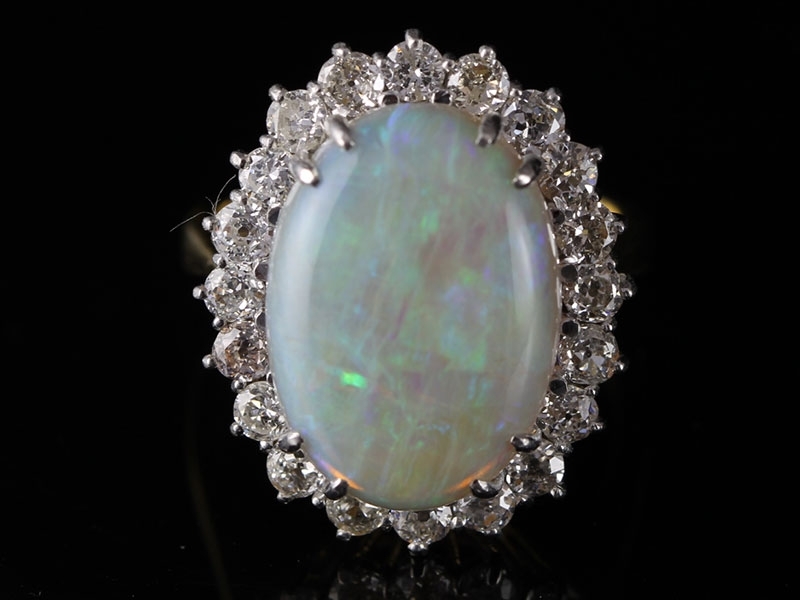 The large Opal displays a mariad of ever changing colours beautifully framed by 12 sparkling Caribbean Blue Zircons. 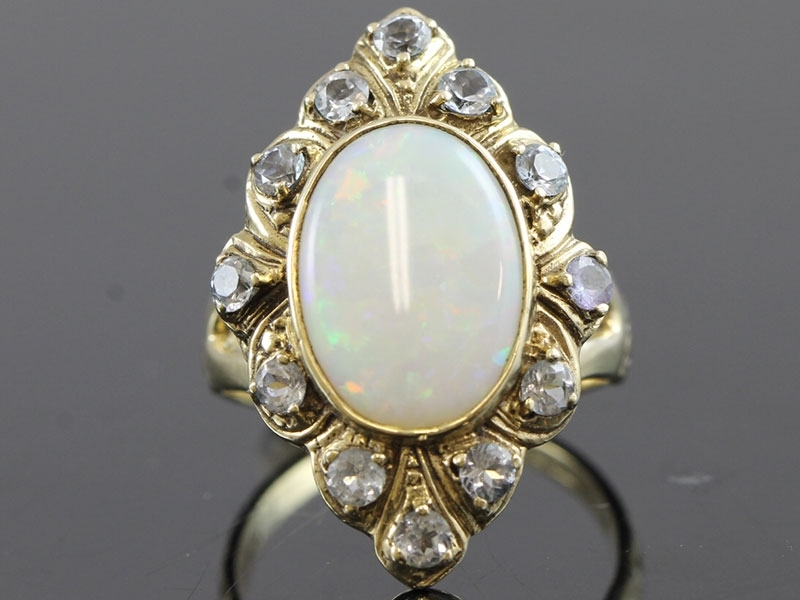 A fabulous vintage reproduction Opal Ring in 9 carat Gold. 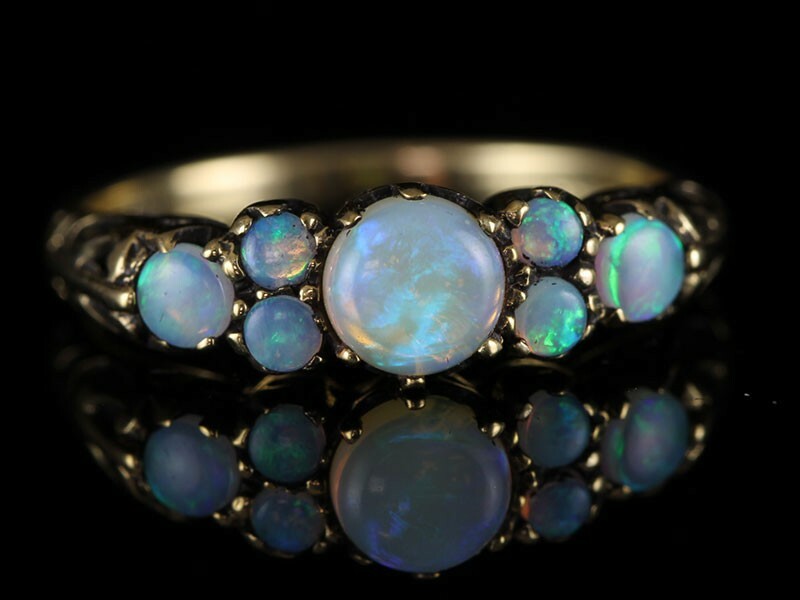 This wonderful Opal ring holds a stunning array of genuine circular Opal gemstones. 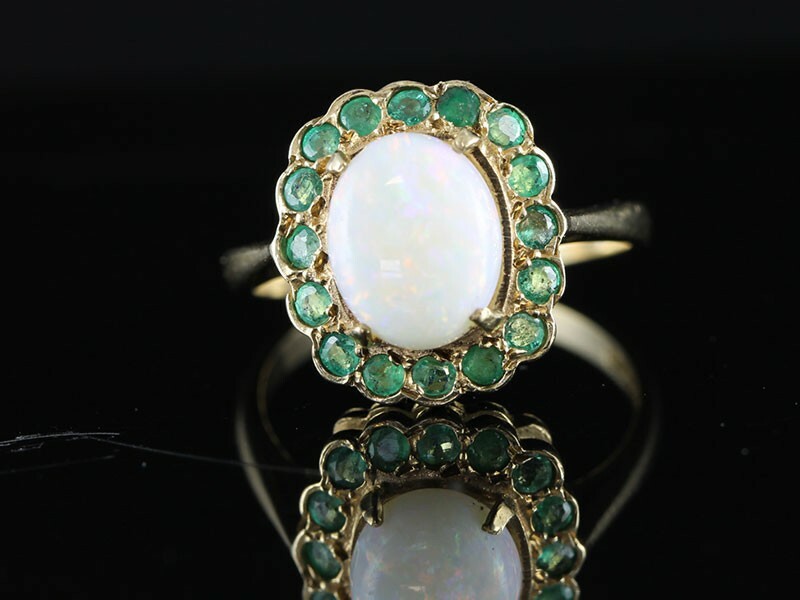 This lovely reproduction Opal and Diamond ring is handcrafted in 9 carat Gold and is a wonderful example from the Edwardian period. Stunning inspired Victorian antique ring. 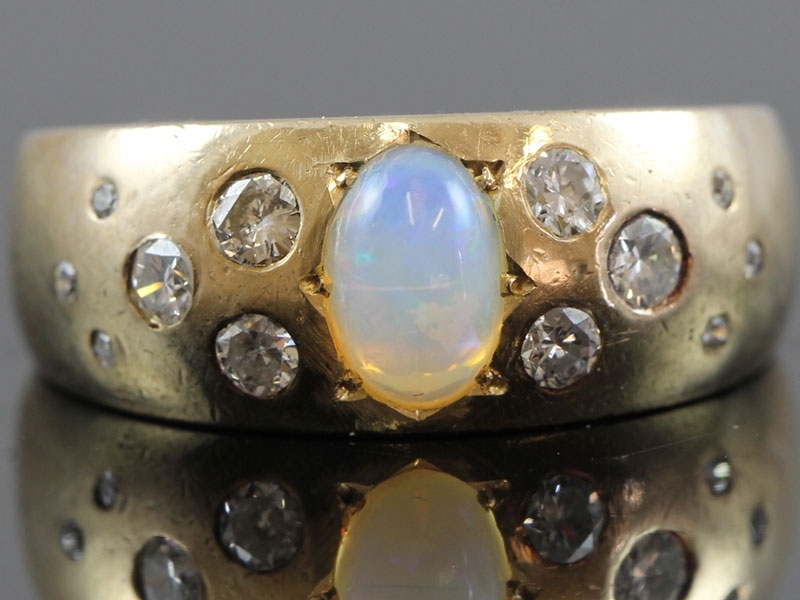 This inspired Victorian antique Opal ring is 9 carat Gold. 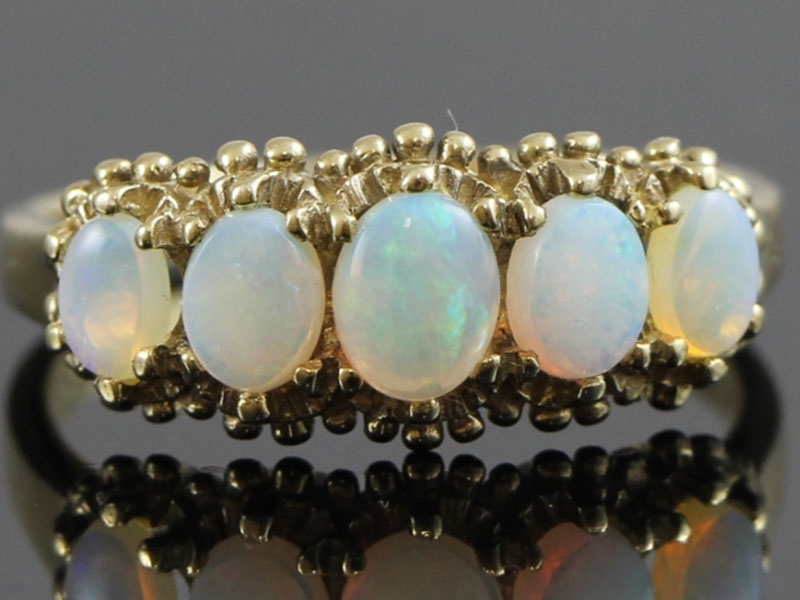 The Opals are wonderful, bright and lively, showing greens, blues, yellow and mauve etc. 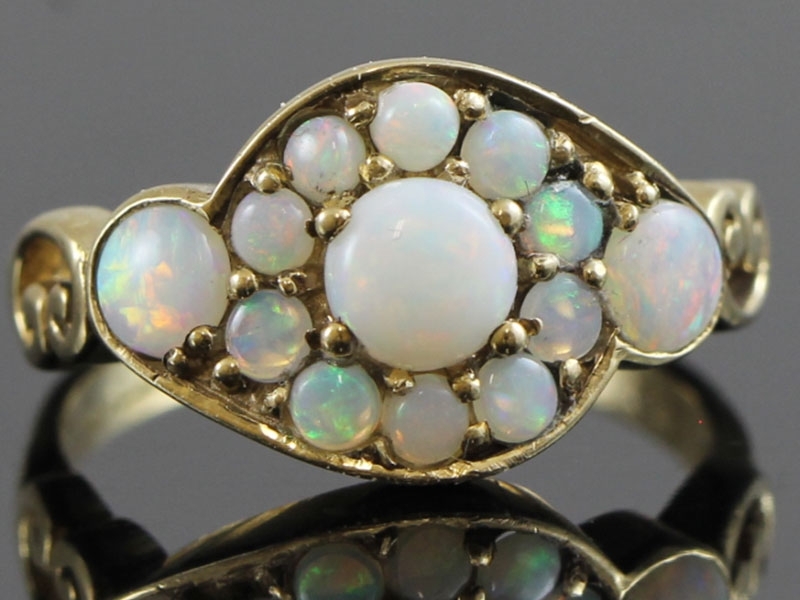 This lovely antique inspired Opal ring is crafted 9 carat Gold. It has a bit of a rose gold hue to it, with antique styling reminiscent of Victorian period pieces with tiger claw prongs, split prongs between the stones. 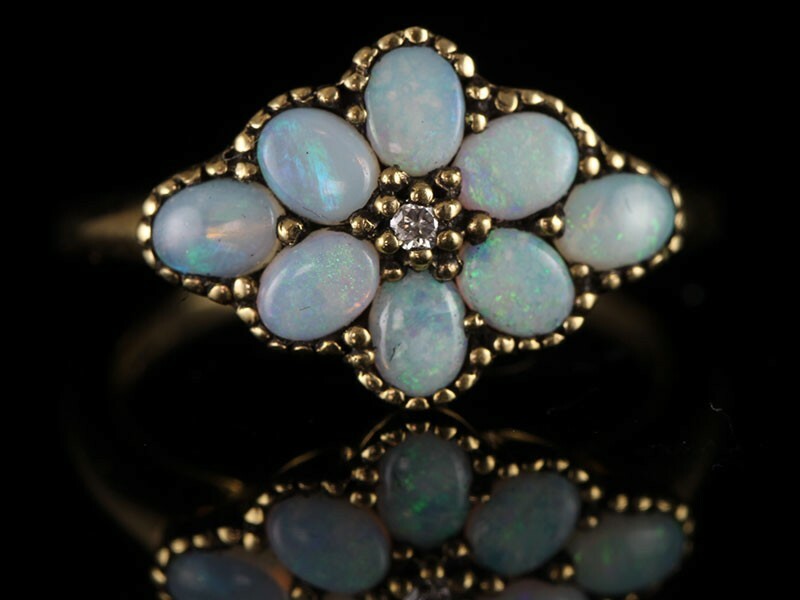 This is a very beautiful inspired vintage Australian Opal and Emerald ring set in 9 carat Gold. This magnificent cocktail ring features a very high quality 6 carat Australian Opal and is showcased by 20 sparkling high quality Diamonds. 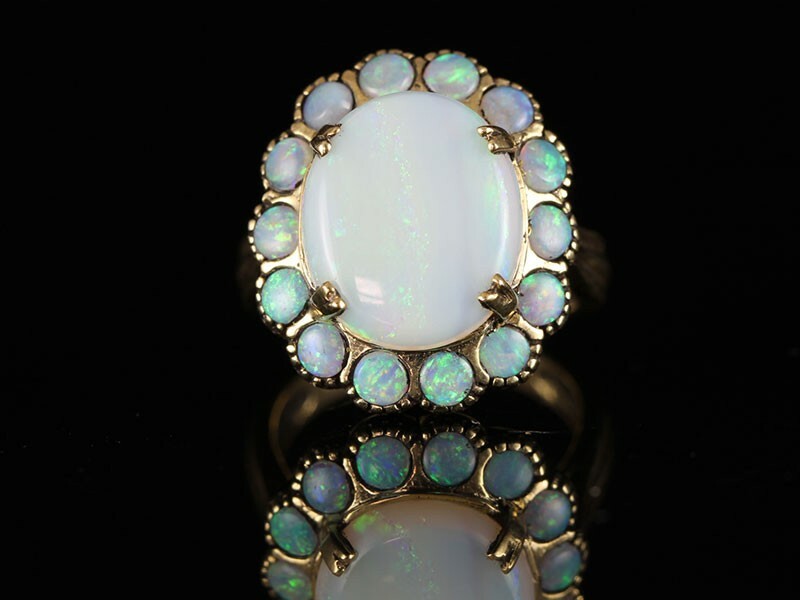 An enchanting white Opal displaying predominant lime green flashes against a multi-coloured background, fills the centre of this enchanting ring. The more you wear it the more you will love this magical cocktail/dress ring. From all directions these beautiful opals emits a multi-hued, rolling refulgent glow that mesmerises - exactly what Opals should do. 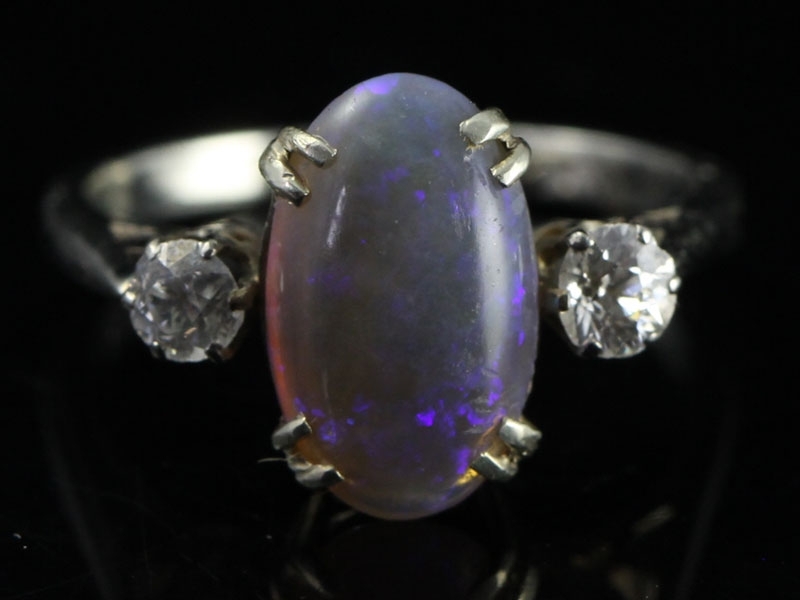 An enchanting white round Opal displaying predominant vibrite red flashes against a multi-coloured background, fills the center of this enchanting ring. 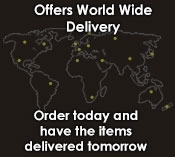 A truly breathtaking design to wear with love and passion, simply the perfect way to treat yourself or the one you love. The magnificent colours of this two carat black phantom Opal has been hidden under the earth in darkness since ancient times and then pulled out of the ground to display its opalescence in the light of day, is truly wonderful. 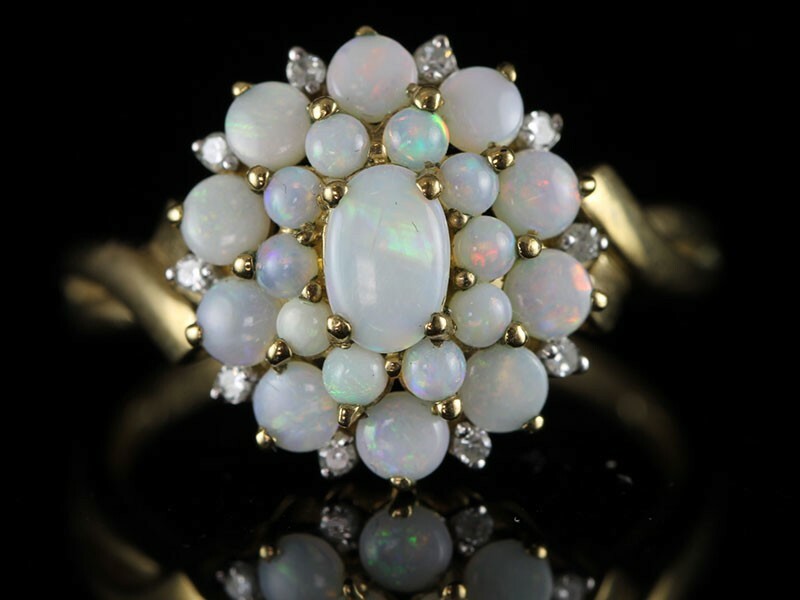 A very unusual Opal and Diamond ring the design inspired from the Mid Victorian (circa 1870) era! Highly distinctive and as sweet as can be.